Bono, The Edge, Adam Clayton, Larry Mullen Jr.
With the release of U2’s new video collection, The Best Of 1990-2000, I confront a glass is half-full/half-empty situation. Do I savor this fine package, or do I take the opportunity to gripe that they put out The Best Of 1980-1990 on VHS four years ago, announced – and then cancelled – a DVD in early 2001, and we still don’t have that product? I’m inclined to follow both paths, as I remain cheesed that we haven’t gotten a 1980-1990 DVD yet. However, since I’m so jazzed to watch 1990-2000, I won’t whine too much. Though saddled with a misleading title, 2000 does mostly include material that appeared during the credited time frame. We get nothing from 1990, as U2 remained officially idle that year; they between some Rattle and Hum related singles in 1989 and 1991’s Achtung Baby, no new U2 product appeared. In addition, 2000 includes some videos that didn’t exist until 2001 or even 2002. Though “Stuck In a Moment You Can’t Get Out Of” appeared on 2000’s All That You Can’t Leave Behind, the single and video weren’t released until 2001. Both “Electrical Sky” and “The Hands That Built America” came out as part of the album version of 2000 and didn’t exist in any form until 2002, which makes the title even odder. Despite some of these gripes, 2000 offers a nice compilation. For reasons unknown, the folks who produced it considered 16 of the videos to be “standard”, and another seven appear as “bonus” clips. I’ll discuss those in the supplements section, but the DVD includes the option to watch the whole program from start to finish with those extra seven videos, and I can’t quite figure out why they’re not considered as part of the normal canon. Whatever the case may be, I’ll run through the 16 “standard” videos and offer my reactions and ratings for each in the order they appear. 2000 doesn’t present the clips chronologically. Instead, they pop up seemingly at random; if a theme or coherent pacing occurs, I can’t figure out what it might be. Anyway, here we go! It might be the first video on the collection, but Even Better Than the Real Thing came as the third single from 1991’s Achtung Baby. It certainly kicks off 2000 well, as it offers arguably the best video of the bunch. Dizzying, exciting, and funny, it packages scads of imagery into the short, and it lends itself to judicious freeze-framing as well. “Real Thing” earns a perfect 10 out of 10 – it’s the best video in this set. I never thought much of “Real Thing” as a song, but I’ve always loved Mysterious Ways. Unfortunately, that video seems decent at best. The second release from Achtung, it features U2 in Morocco and also depicts locals and belly dancers. Bono lip-synchs and we see some funhouse mirror distortions of him. The song still works great, but the video seems ordinary and lacks anything to make it particularly winning. 5 out of 10. A moderate improvement, Beautiful Day provided the debut single and video from 2000’s All That You Can’t Leave Behind, but it didn’t give us the best from that album. Fairly simple, the video combines lip-synching within an airport environment. Toward the end, this becomes cool as we see U2 perform on a runway as jets scream over their heads, but otherwise the video comes across as average. A fairly good song, “Day” also isn’t among the best from Behind. 6 out of 10. Since I already reviewed 2002’s Electrical Storm individually, I’ll let you visit that article to check out my detailed comments about it. Quick summary: fairly average song and video. 6 out of 10. As I’ll mention when I get to the supplements, Achtung’s One went through a complicated production history and three different videos exist for it. This one is the best, as it offers a simple, elegant and moody exploration of the song’s themes. Great song, fine video - 8 out of 10. Technically not a U2 song, Miss Sarajevo comes from an offshoot project called Passengers. That group included U2 with Brian Eno, which really just meant it was U2 under a different name. The band’s fairly loose and ethereal music never moved me; I listened to the Passengers album a couple of times and gave up on it. Though the best song from that release, it still doesn’t do much for me, and I don’t like this video either. The “Sarajevo” video combines shots from the beauty contest that inspired the tune, street scenes, and clips from a TV performance of the song. Annoying, the latter are made to look like we’re actually watching them on a television, so we see them with scan lines and all. Other than a rare glimpse of Edge without a head covering, this clip seems dull and lacks the emotion it wants to inspire. I’d rather just see the TV performance; this version merits just a 3 out of 10. Much better, off of 1993’s Zooropa we get Stay (Faraway, So Close! ), a track that also appeared in the Wim Wenders flick Faraway, So Close! Directed by Wenders himself, the video appropriates the movie’s angel imagery and puts the band in positions similar to those of the characters. Happily, it mostly avoids shots from the picture itself, and when they do appear, it integrates them seamlessly. 7 out of 10. From good to better, we move to Stuck In a Moment You Can’t Get Out Of, the second video from All You Can’t Leave Behind. Like “One”, this song enjoys more than one version, but this one seems like the best of the pair. Set at a football game, it includes a cameo from John Madden and packs scads of U2 inside jokes; for example, they play at the “Unforgettable Firedome”. Fun and amusing, it even offers Larry as a rabid fan. That’s worth the price of admission alone. 9 out of 10. A simple performance clip, our first track from 1997’s Pop features Gone, the which never became a single off of the album. Taken straight from the PopMart Live From Mexico City video – still waiting for that one on DVD, thank you very much! – I like the song and this offers a decent but unexceptional rendition. The video displays the performance in an adequate manner, but you’ll find nothing exciting here. 5 out of 10. Another live video, Until the End of the World was never a single from Achtung, and this clip actually comes from a 1992 Fox TV special that covered the Zoo TV Outside tour. It starts with a funky faux newscast set-up, but after that, it offers a straight performance clip. The version seems good, but the video loses points due to some interjected shots from external sources and a bit of fake grainy imagery. 5 out of 10. One of two new songs on 2000, The Hands That Built America provides one of the most basic videos in this collection. It simply depicts rehearsal shots for the song. It suits the song reasonably well but doesn’t do much to involve the viewer. The tone comes across as pretty mediocre as well. 4 out of 10. The first single off of Pop, Discotheque declared the intentions of U2 circa 1997. Unfortunately for the band, the world declared right back at them that they didn’t much dig the new electronic vibe. Well, I liked Pop and I think “Discotheque” offers a fizzy and lively little track that stands up with their best. Don’t let the bubblegum clothes fool you – this is a tight tune. I never saw the full video until I got 2000, but snippets I’d witnessed raised my expectations. The whole piece doesn’t live up to them, but it’s still definitely an above average video. Where else can you see U2 done up in Village People garb? We also get another glimpse of bareheaded Edge, and the video’s worth a look just to see how incredibly unhappy Larry appears during the campier scenes. 7 out of 10. Taken from the soundtrack for 1995’s Batman Forever, Hold Me, Thrill Me, Kiss Me, Kill Me provides a schizophrenic video. It mixes movie clips with original animation of the band done in a Batman theme. This shows two of Bono’s alter egos – the Fly and MacPhisto – as they go against each other. If this sucker consisted just of the animation, it earn an 8 out of 10. The quality of that work seems cheap, but it’s still a creative way to do a music video, and it appears fun and clever. Unfortunately, the piece includes way too many shots from the movie, and they really make it drag at times; had the whole video consisted of those images, I’d have given it a 2 out of 10. As such, “Hold Me” as a whole nets a 5 out of 10. The second single from Pop, Staring At the Sun always left me cold because it sounded far too much like “One”; I snidely refer to it as “Two”. If we ignore the self-plagiarism, it’s a decent song, though I much prefer the radically different “Monster Truck” mix found on the single. The video works surprisingly well. It gives us a simple combination of moody and trippy lip-synch shots that connect with the track nicely. It doesn’t offer anything extraordinary, but it elevates an otherwise lackluster song, and it features Edge sans headgear again. 7 out of 10. Edge wears his little toque throughout Zooropa’s Numb, and he also takes a rare lead vocal. Actually, he offers more of a lead mumble, but the song stands out as successful experiment, and the video comes across as one of the best of the bunch. Essentially Edge sits in one place while random folks approach and abuse him in various ways. It peters out somewhat toward the end, but it remains clever, creative and funny. 9 out of 10. Perversely, 2000 ends with the oldest video in the set: The Fly, which provided the first single from Achtung. Mostly it features some lip-synched performance shots along with some previews of themes that would dominate the 1992-93 tour. It seemed more interesting when it was new and fresh. Now it just seems decent but unexceptional. The song still rocks, though. 6 out of 10. Overall thoughts: though the collection includes its peaks and valleys, the overall quality of The Best of 1990-2000 seems quite good. Not many acts can sustain such a high caliber of material as a whole, and I rarely felt bored during the DVD. The best videos seemed excellent, while the worst still offered watchable experiences. Based on the music and the clips themselves, 2000 provides one of the strongest music video packages on the market. 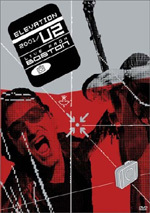 U2: The Best Of 1990-2000 appears in an aspect ratio of 1.33:1 on this single-sided, double-layered DVD; due to those dimensions, the image has not been enhanced for 16X9 televisions. Actually, aspect ratios varied. While most of the videos went fullscreen, four of them – “Stay”, “The Hands That Built America”, “Discotheque” and “Stuck In a Moment You Can’t Get Out Of” – looked to be 1.78:1. In addition, “Numb” and “Hold Me, Thrill Me, Kiss Me, Kill Me” appeared to be 1.66:1. To further complicate matters, the movie clips seen during “Hold Me” jumped to 1.85:1. Every time I review a collection of music videos, I complain about how tough it is to fairly grade picture quality. Not only do the videos come from a range of years, but also a lot of times they look terrible due to the director’s intentions. Even given those considerations, I felt somewhat disappointed by the visual quality of 2000, which suffered from some problems that didn’t seem related to the original clips. Sharpness appeared erratic. At times the videos came across as reasonably accurate and distinct, but those qualities didn’t seem consistent. Some of the clips displayed rather soft visuals; for example, “One” looked noticeably fuzzy. Shimmering and jagged edges marred some of the videos, and I also noticed surprisingly intrusive edge enhancement during many of the clips. “Beautiful Day” really suffered from this tendency, and the edge enhancement most likely caused much of the softness I observed. Source flaws displayed occasional example of speckles and marks, but otherwise the material seemed to be acceptably clean. Colors varied dependent on the director intentions, and the tones occasionally came across as slightly messy and drab. However, the hues generally appeared acceptably concise and distinct. Black levels also depended on the intentions of the original footage. They mostly seemed deep and tight, though, and shadow detail looked appropriately heavy but not too thick most of the time. Really, the softness and edge enhancement created the biggest problems, and they caused me to give 2000 only a “C-“ for image; while there’s a limit to how good music videos can look, I think this set could have offered superior visuals. On the other hand, the PCM stereo soundtrack of Best of 1990-2000 provided a positive sonic experience. It surprised me that the U2 set didn’t get the full 5.1 treatment, but it didn’t bother me at all, as the music sounded quite good. (The packaging indicates the presence of a Dolby Digital 2.0 track, but it doesn’t appear.) Stereo imaging seemed solid across the board. Of course, those elements depended on the original tracks, but for the most part, the instrumentation and vocals appeared neatly delineated and easy to distinguish within the mix. It all spread across the front well and seemed to aptly reproduce the source material. Audio quality also seemed fine. Vocals sounded clean and distinct, though again, the original production affected this; for instance, “Hold Me” is supposed to offer a very thin and processed tone, which it does. The various instruments sounded clear and nicely defined, and bass response came across as appropriately deep and tight. Overall, the audio of Best of 1990-2000 more than adequately replicated the music. Best of 1990-2000 packs a fine roster of extras, and we start with a collection of bonus videos. Don’t ask me to explain what constitutes a “bonus” video. I think a few of them never were officially release, but I know that’s not true for all of them, so that doesn’t explain the distinction. Perhaps the producers of the set just didn’t want to include them on the VHS version of 2000 so they’re considered a bonus for DVD fans. I couldn’t find a tracklisting for the VHS version to see if they differ, but this thought makes sense, I suppose, especially since the much-maligned Pop dominates this section; four of these seven videos come from that album. As an aside, here’s how 2000 breaks down via album if I combine the standard program and the “bonus” videos. (This doesn’t count the alternate clips I’ll soon discuss.) From Achtung Baby, we get six tracks. Zooropa offers three videos, while Pop knocks out a whopping seven clips. Only two numbers come off of All That You Can’t Leave Behind, and we also find two new songs. “Hold Me” and “The Ground Beneath Her Feet” emanate from soundtracks, while “Miss Sarajevo” stems from Soundtracks, the Passengers album. Basically, all of this means that Achtung and Pop fans will feel happy; if you don’t like those albums, you’ll not find much to appease you here, since 13 of the 23 tracks come from those two releases. We get seven of these “bonus” videos. Arguable the best song off of Pop - and a killer in concert - Please presents a mix of Bono’s lip-synching and images of folks on their knees in the street. Frankly, the thing confuses me, but it seems intriguing and unusual nonetheless. 7 out of 10. Another Pop number, the video for If God Will Send His Angels will already look familiar to owners of City of Angels, as it also appears on that DVD. It shows funky time lapse photography. Bono lip-synchs in a diner booth as the patrons around him rapidly change. It uses splitscreen, with Bono’s side of the booth on the top and the other bench on the bottom. The concept seems creative and interesting, but the piece doesn’t go much of anywhere. 7 out of 10. The final single from Achtung, Who’s Gonna Ride Your Wild Horses? provides a simple affair. Basically we see black and white band lip-synch shows integrated with a concert montage. It seems cheap and fairly cheesy. 3 out of 10. Much better, Zooropa’s Lemon offers a creative piece of work. Based on the photography of Eadweard Muybridge, it consists on a series of quirky motion studies like “Man Playing Pool”, all of which are acted out by the band. Bono’s parts alternate between MacPhisto and the Fly. The theme gets a little old by the end, but it still seems clever and amusing. 8 out of 10. The third single from Pop, Last Night On Earth offers vaguely post-apocalyptic visuals that match the tune. U2 pick up a babe and drive through this moderately nightmarish world. The video seems interesting and enjoyable, though it feels a bit predictable for the song. 7 out of 10. 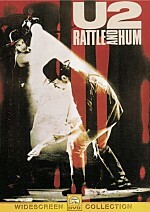 A number of the videos on 2000 use remixes of the songs, but most stay reasonably close to the source material. Not so for Mofo, the seventh and final Pop clip. The remix seems cheesy and annoying, and the video itself merely provides a crude montage of live elements from the PopMart tour; some come from “Mofo”, but many other songs appear as well. The annoyingly loud overdubbed crowd roar knocks a point off my grade. 3 out of 10. A lovely and elegant little song, The Ground Beneath Her Feet offers a collaboration between U2 and writer Salman Rushdie, and it comes from the soundtrack of Million Dollar Hotel. While a nice song, the video seems predictable and dull. It offers the standard mix of band lip-synch elements and movie clips, and it does nothing to elevate the format. 4 out of 10. Next we move to a collection of five alternate videos. The “Dance Mix” of Even Better Than the Real Thing mostly comes across as a series of outtakes from other videos, and there’s really not much to this bland mélange. I don’t much care for the remix either. 3 out of 10. As I alluded earlier, One experienced an unusual route to the MTV screen, and this clip offers the third of the three versions. Directed by Phil Joanou, it seems pretty simple, as it mostly just shows Bono as he lip-synchs at a bar table and smokes. It also includes some live clips from the then-nascent Zoo TV tour. (Not “Outside” yet, it started in arenas in the late winter of 1992; that’d be the last time would play venues smaller than stadiums for nine years.) The video doesn’t do anything special, but it fits the song acceptably well. 5 out of 10. Apparently the first video created for Stuck In a Moment You Can’t Get Out Of, the Kevin Godley-directed piece aired mainly in Europe, while Americans got the football one. Basically it shows Bono as he repeatedly gets tossed from a moving van. I much prefer the American edition, but this one seems decent. 6 out of 10. Much less interesting, the Morleigh Steinberg-directed Staring at the Sun looks like a home movie travelogue. It just shows the band as they wander a vaguely tropical locale. It seems quite boring. 3 out of 10. Credited to “Emergency Broadcast Network”, this version of Numb mainly consists of stock footage and sound effects edited together, and it appeared during the Zooropa tour when the band played the song. Edge lip-synchs some as well, but the collage of snippets makes up most of this moderately interesting video. I like the alternate version of the song, though. 5 out of 10. Most of the 28 videos on 2000 offer audio commentaries. These come from their directors; unfortunately, unlike the Smashing Pumpkins’ Greatest Hits Video Collection, the commentaries don’t involve the band. Still, they provide some god information. Some of the directors concentrate on technical elements of their clips, while others go more into the dynamics of the shoot and/or what they wanted to achieve. Of course, given the length of the videos, the directors don’t have much time to elaborate, but they usually offer good information about their work. Note that no commentaries appear for the following videos: “The Hands That Built America”, “Mofo”, “Gone” or “Until the End of the World”. In addition, the Steinberg “Staring at the Sun”, the dance “Even Better Than the Real Thing” and the “Emergency Broadcast Network” version of “Numb” also lack commentaries. However, we find two commentaries for “The Fly”, as it offers a second discussion from co-director Richie Smyth. Some folks have wondered why 2000 includes an apparently empty third audio channel. Smyth’s chat is the reason for that; it offers the sole element of the extra track. After this we locate three documentaries. “U2 Sur Mer” consists of video clips, shots from the filming of the video, and comments from Bono, Larry, director Anton Corbijn, and actor Samantha Morton. The seven-minute and 22-second piece doesn’t fully get into the creation of “Electrical Storm”, but it features some good behind the scenes images as well as some informative remarks. More worthwhile, “A Story of ‘One’” takes 14 minutes and 42 seconds to get into that video’s sticky history. We learn of how the song aided the band’s reinvention and then go through the creation of the three different videos. We also learn why various clips didn’t make the cut. Comments appear from directors Mark Pellington and Phil Joanou as well as the Edge. The program nicely covers the whole process behind the making of the three videos, and it offers some interesting behind the scenes footage as well. 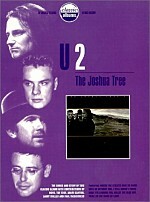 Another good little program, “Missing Sarajevo” looks at U2’s September 23 1997 concert in Sarajevo. Mostly traced with narration, the 11-minute and 39-second piece relates the show’s origins during the 1993 Zooropa concerts and also discusses the Bill Carter documentary that inspired the Passengers song. Edge and Bono offer the occasional impromptu comments, but mostly the narration and the candid visuals make this a compelling piece. A few minor bits round out 2000. The set provides cool packaging, as it includes a slot for purchasers of the “Limited Edition” CD set to place that release’s “History Mix” DVD. It also includes a very nice booklet that features photos as well as credits for all of the “standard” videos. The booklet’s text gets into some history and remarks about the videos as well, so it merits a look. One oddity about the packaging: since the buffaloes from the original version of “One” dominate 2000, shouldn’t the set actually include that video? Unless it’s buried somewhere, the Mark Pellington edition of “One” goes missing here. 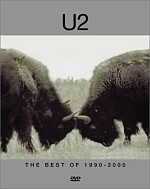 One of the best compilations of music videos on the market, U2’s Best of 1990-2000 provides a lot of entertainment. Including “bonus” and alternate versions, we find 28 videos here, and most of them work quite nicely. A few duds pop up along the way, but I like the majority of the videos, and an even higher percentage of the songs remain solid. Unfortunately, picture quality seems erratic and somewhat flawed, but the audio represents the original music well, and the set packs a fine collection of supplements. Purchase of Best of 1990-2000 falls into the “no-brainer” category. Fans of U2 will definitely want to add it to their libraries, and those with a less active interest should also pick it up, as it offers a fine primer for the band’s Nineties work.